Caddington (TL 065 195) is a village and civil parish in the Central Bedfordshire district of Bedfordshire, England. 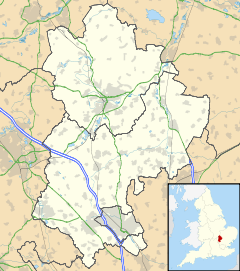 It is between the Luton/Dunstable urban area (to the north), and Hertfordshire (to the south). The western border of the parish is Watling Street, to the west of which is Kensworth. The northern and eastern border are generally formed by the railway line and the M1. To the south-east of the parish is the parish of Slip End, and to the south is Markyate, in Hertfordshire. Caddington village and the nearby hamlet of Aley Green are in the south of the parish. The hamlet of Chaul End lies in the north of the parish, and at the border with Luton there is Caddington Park with Skimpot in its postal address. The Zouches Farm radio tower is situated in the north-west of the parish. The place-name 'Caddington' is first attested in a list from circa 1000 AD of the manors of St Paul's Cathedral in the Parker Library of Corpus Christi College, Cambridge, where it appears as Caddandun. It appears as Cadandune in the Codex diplomaticus ævi Saxonici of circa 1053, and as Cadendone in the Domesday Book of 1086. The name means 'Cada's down or hill'. The parish of Caddington was formerly partly in Hertfordshire and partly in Bedfordshire, but under the provisions of the Local Government Act of 1888, confirmed in 1897, it was transferred wholly to Bedfordshire. A part of Caddington parish was transferred in 1877 to Markyate ecclesiastical district upon its formation from surrounding parishes. Caddington was once the centre of a thriving brick industry built around the rich source of clay. In 1908 there were two major brick fields. A "Caddington Blue" was a well-known engineering brick. [further explanation needed] Yet the assertion relating to the Caddington Blue is regarded by some as suspect: During the 1970s Bedfordshire County Council in conjunction with the Royal Commission On Historical Monuments (England), published the book Brickmaking: A History and Gazetteer. The book identifies 17 specific sites within the Caddington locale which are credited with producing "Greys". The common name for the plum-coloured brick produced from the flinty brick earths excavated from an area from Kensworth through Caddington to Stopsley is "Luton Grey". Much of Caddington is now urban and there has been much residential development in recent years with the provision of local facilities such as shops, schools and a public hall. Caddington still retains its village green and nearby is the medieval parish church, restored in Victorian times. Manshead School (formerly Dunstable Grammar School) relocated to Caddington in 1971. Markyate Priory, disestablished in 1537, was situated in Caddington. Caddington has had various schools such as Willowfield and Heathfield Lower Schools and Five Oaks Middle School but these have since been combined into Caddington Village School. Caddington has a Non-League football team Caddington F.C. and a thriving cricket club with three adult teams and a youth development section. It is also home to Caddington Chequers FC who compete in the Leighton & District Sunday Football League. The Chequers Public house have also sponsored Caddingtons newest football club, AFC Chequers Caddington who compete in the South Beds & district Sunday football league. Football and Cricket fixtures are hosted at the Caddington Recreation Association in Manor Road which, as well as providing sports facilities also has a function room and members' bar. Two local public houses can be found either side of the village green, namely The Cricketers and The Chequers. Caddington has an annual village show in September incorporating a produce show, dog show and craft fair. All Saints, Church of England, The Green, LU1 4BG. – A lovely 11/12C church in the middle of the village. St Thomas Apostle[permanent dead link], Catholic Church, Manor Road. (Served from St Margaret of Scotland, Farley Hill, Luton.) – A small church next to the Recreation & Social Club on the south side of the village. Mass Saturday 18:00. Caddington Baptist Church, 27 Luton Road, LU1 4AF. A dedicated church opposite All Saints. Sunday 11:00 and 18:15. Aley Green Methodist Church (Methodist), Mancroft Road, Aley Green, LU1 4DR. – In the nearby village of Aley Green. ^ "Civil Parish population 2011". Neighbourhood Statistics. Office for National Statistics. Retrieved 4 November 2016. ^ The Aley Green pages listed under External links state that Aley Green is in the parish of Caddington. But the cemetery and the southern end of Mancroft Road, which are in the parish of Slip End, are sometimes also described as Aley Green (for example, in postal addresses and on Google Maps). ^ Eilert Ekwall, The Concise Oxford Dictionary of English Place-names, p.80. ^ a b c d British History Online: Caddington, accessed September 2017. ^ Brickmaking: A History and Gazetteer, Survey of Bedfordshire; Author: Alan Cox, Contributors: Bedfordshire (England) County Council, Royal Commission on Historical Monuments (England); Edition illustrated; Publisher: Bedfordshire County Council, 1979; ISBN 9780901051868; 110 pages. Wikimedia Commons has media related to Caddington. This page was last edited on 27 November 2018, at 11:51 (UTC).